Dispari&dispari presents DYNASTY (opening on Friday, May 22 at 6pm), a new solo show by Patrick Tuttofuoco that continues the artist’s research started with the public art intervention “… Mom, Dad”—realized in Milan on the occasion of miart 2015. This new exhibition represents the second key moment in the collaboration between Tuttofuoco, Nicola Ricciardi (curator of both projects) and Andrea Sassi (director of dispari&dispari and producer of the work), aimed at re-reading and re-interpreting a 15-year artistic career through the lens of the history of portrait painting and photography. The third and final moment will take the form of a monographic publication edited and designed by Mousse Publishing (Fall 2015). 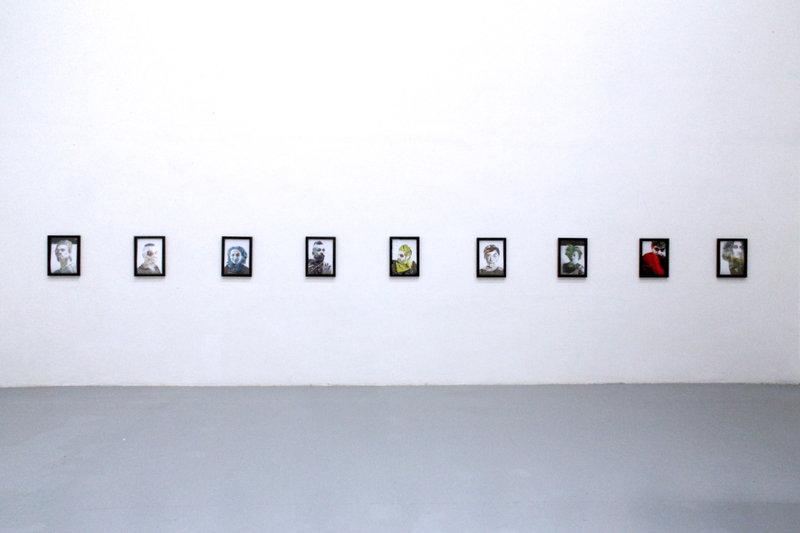 Like the Milan’s project, DYNASTY starts from (and revolves around) the study of archetypal iconography and its contemporary transformations, the ethics of cooperation and the concept of family in the arts. 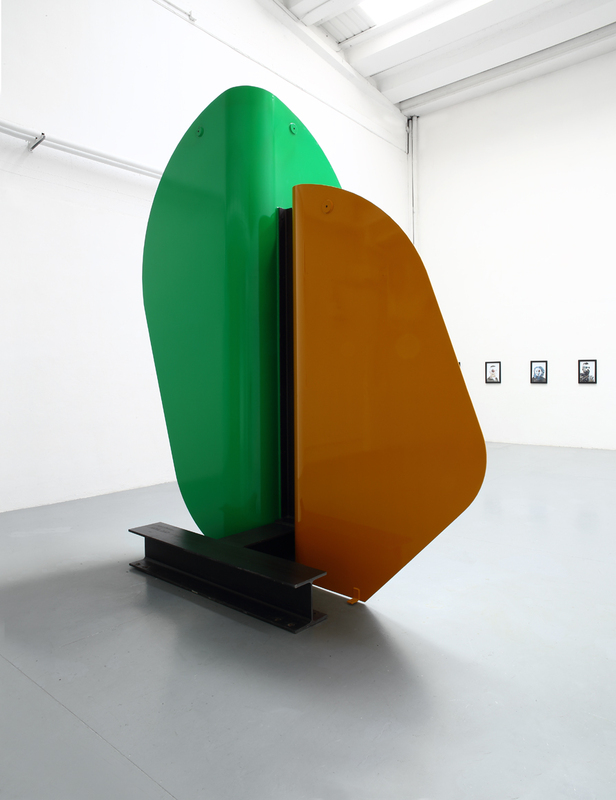 However, if on the one hand “… Mom, Dad” marked Tuttofuoco’s return to public art, in this new iteration the same work is proposed in a new setting emphasizing its private dimension and its relationship not with History but with personal memories. The portrait of Tuttofuoco’s “putative family” is here seen from behind, with the structure holding the portraits of Nefertiti and Alexander the Great concealing their faces—which in this new configuration appear as intimate, secluded, discrete. The sense of intimacy is then reverberated by a series of photographic portraits where the distinctive features of friends and peers of Tuttofuoco mingle with environmental elements—seaweed, shells, stones—coming from the seashore of Pescara, the city where the artist spent the last year for family reasons. 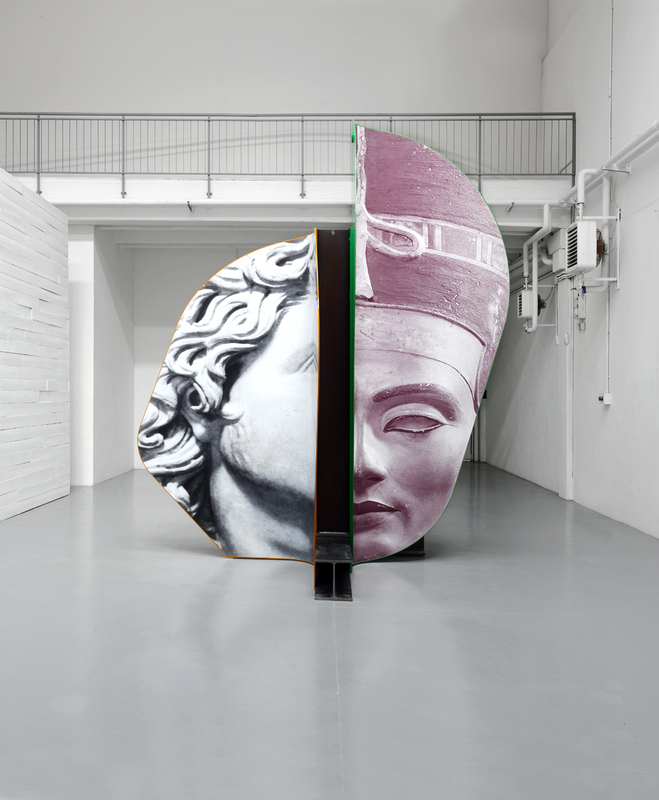 The faces of Diego Perrone and Paola Pivi, Massimo Grimaldi and Roberto Cuoghi, of those who accompanied the artist from the Academy of Fine Arts to present day (some more closely, other with detachment) become the symbols of the natural need to look at the past in order to interpret the present. Once again—and in this case in a deliberately explicit way—portrait becomes the language preferred by Tuttofuoco to address the issue of identity. 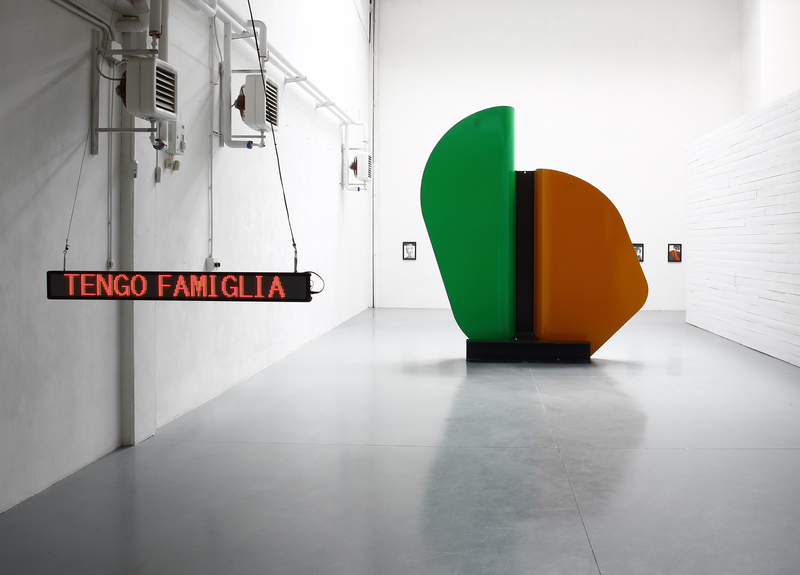 The exhibition also includes a site-specific work: a LED sign that ceaselessly repeats the phrase “Tengo famiglia”, meaning “I got family”. Commonly (though erroneously) the expression is attributed to the writer Ennio Flaiano, who’d suggested the motto to be sewed on the Italian flag in 1945: a second, explicit albeit intimate, reference to Pescara, birthplace of the writer; but also a further reflection on the duties and honors, joys and burdens of the affective sphere. If the motto generally implies those obligations and responsibilities implicit in parental relationships, through the playfulness of the LED, Tuttofuoco seems to bring it back to its original lightness and to the liveliness typical of Flaiano.